Anyone recently flown Premium Economy to Philippines? Curious what airline, if the seats had more padding and if they had an effective lumbar support? Was this noticeably more comfortable for you? Costs from Left coast US are 50% more as far as I can see. Our last flight to the Philippines was on Cathay Pacific from Las Vegas to San Francisco to Hong Kong to Manila. San Francisco to Hong Kong to Manila was Premium Economy. More comfortable seats than Economy class for long flights. Padding is great if you have a bad back like I do. My observation is airlines at one time offered three classes --First, Business and Economy. First became prohibitively expensive and corporations wanting to reduce expenses were telling their employees to fly Business. The passengers on First were increasingly non-revenue airline personnel. Business became the new First with flat beds for long flights. Premium Economy was later added and the seats remind you of the old Business or old First Class. Service is only marginally better. On our next trip to Manila, I plan to use Singapore Airlines. It will add 4 to 5 hours but their Premium Economy has a very good service reputation. From the West Coast, the shortest flights to Manila is Philippine Airlines which had no Premium Economy. (They are planning to add this class of service.) We use to play the game of buying Economy tickets and bidding for an upgrade to Business. Usually got it because no one wanted to pay Business. Philippine Airlines caught on and started imposing a minimum upgrade bid of $850 one way. Stopped flying Philippine Airlines. 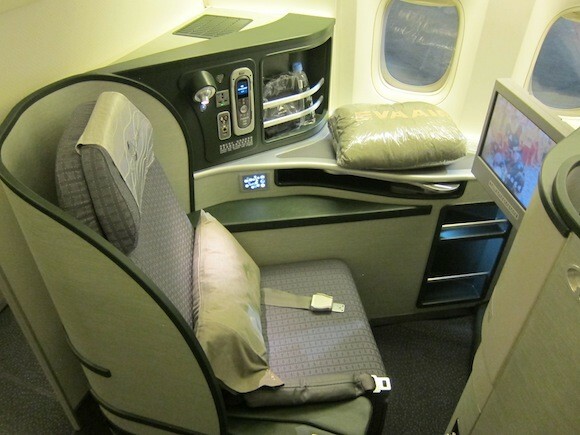 I fly Premium Economy with Eva Air for the larger seats and leg room which is helpful when you are 6 ft 6 inches tall. I didn notice any lumbar support but I didn check also. I have lower back probs sometimes so I just slide my pillow down my back and recline the seat and im good! Im getting very close to Gold mileage membership because the last two trips I was upgraded to Laurel Class without asking. But man traveling in those cubicles is the way to fly 16 hrs if you can!! Anyone recently flown Premium Economy to Philippines? We flew Phil Airlines premium Economy to Australia. As said above, move leg room, seats seemed wider, stew service was more individualized...……..but the food still sux lolololol. Oh and prioritized boarding. Scott, I think I learned of this from you. In an earlier post you may have mentioned using Premium Economy. From what I read: Seats are larger overall one to two inches wider with lumbar support more padding up to 4 to six inches of leg room and will recline farther back. Full price adds $1,000 round trip. I would guess less on sale? The way my lower back neck are now the cost although painful would be worth it. In 1998 1999 and 2000 I few EVA Evergreen Deluxe a business seat but cloth with third class food. The cost was about 25% higher I if I remember correctly. I don't much mind airline food I'll eat anything if I'm hungry. If you want more space and comfort you might consider an alternative to premium economy? Some of the budget carriers like Scoot offer a product (like Scoot Biz) that's really 'premium economy equivalent, extra leg room, wider seats that recline further and a separated area with it's own toilet. I've used that a couple of times between Melbourne and Manila (you can bid to upgrade and often you'll get it for a fair bit less than regular price). FYI scoot is the budget carrier arm of Singapore airlines and if you travel Scoot Biz you generally get 3 hours of lounge access at Changi included which can be handy. Now this is the way to fly for 16 hour flight! Premium Economy and Business Class are for the poor. You need First Class and it's only 900,000 PHP from Manilla to London!